Just hours ago the very first official game took place at Zenit Arena. Except Zenit doesn’t want to be mentioned in its name and no wonder. This monster requires a lot of further work. This construction had been with us since the very beginning of our construction section, long before we launched the English version. “In progress” since late 2006, the stadium has been under construction until very recently. Officially, but off the record there are still workers on site. At least Zenit finally held their first game. Yet even they cannot be sure when they can move in for good. Saturday evening saw the Zenit – Ural (2:0) game, the very first official football clash at Krestovskiy Ostrov’s new stadium. We treat it as the official opening, especially since it follows the February test events. However, just over 20,000 people were allowed inside the stadium, occupying part of the lower tier. Capacity is now expected to increase by 10,000 for the May 7 game against Terek and then reach possibly 40,000 against FK Krasnodar (May 17). First fixture with sell-out crowd of roughly 68,000 people will be the opening of 2017 Confederations Cup on June 17. In a surprisingly honest interview published by Fontanka.ru the CEO of Zenit Maxim Mitrofinov revealed that the club weren’t exactly rushing to play at their new stadium. It simply isn’t ready for it, has crucial equipment missing and systems not operational. As a matter of fact, there are still workers on site despite two deadlines for the construction having passed recently (December and March). Zenit agreed to organize the test events because they too need to learn how to function at Russia’s most expensive stadium. With almost 300,000 m2 of floor space, it’s a giant by global standards and would be challenging to operate for any club, let alone Zenit, who to date have operated a stadium of 20,000 seats. And while they said “spasiba” to their old stadium last week, they will most likely return to Stadion Petrovskiy in the 2017/18 season, when the new one will undergo further World Cup preparations. First full season expected to be played at Zenit Arena is the 2018/19 campaign. Zenit’s caution in moving to their new home for three games is understandable. With major systems not working, many things have to be done manually, including transition of season ticket holders from the old stadium to new stands. The club made a huge effort to organize 33 food kiosks around the stadium (44 planned in the future) as they arrived at a stadium almost appliance-free. They even had to buy furniture for basic facilities like dressing rooms. Only in the first weeks of preparations Zenit reportedly spent almost RUB 1 billion ($18 million) on infrastructure and they expect, according to Mitrofinov, to pump up to 5.5 billion ($98 million) by 2019! Zenit will benefit from a symbolic fee of 1 ruble for annual lease of the stadium once they’re in regular operation. But even with that in mind it will be extremely challenging to generate revenue. “I’ve seen speculation that the stadium will pay back in 10 years. I’m not even sure if we manage to recoup our 5.5 billion in 5-10 years”, Zenit CEO said. At the same time he assured that it’s not as bad as it may sound and once the launching period is over, things should run smoothly. Zenit expect that annual running cost for the stadium could reach RUB 700-750 million, while municipal authorities suggest 400 million. However, with Saint Petersburg’s history of underestimating costs (the stadium cost 7 times the amount it was expected to cost! ), it’s probably closer to the club’s estimate. The club fear it won’t break even for at least three years. To get out of the red they would have to get 45,000 people per game and that’s beyond what any Russian club is able to draw. 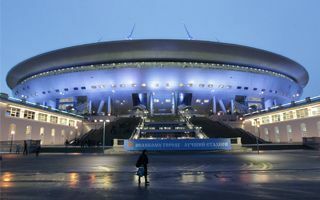 To get as many people as possible inside, Zenit suggest the premium seating would be much more expensive than at the old stadium, while regular seats should actually be cheaper than before. Even if we leave all of the above behind, the new Saint Petersburg stadium just cannot get good press. Even Zenit are asking not to call it Zenit Arena because they simply don’t want to associate themselves with their new home at this point. So for now it’s Krestovskiy Stadion or Stadion Sankt Petersburg. Just since this year began one major tender worth almost a billion rubles had to be canceled for illegal conduct. Then was the scandal regarding 110 North Korean slave workers garrisoned beside the stadium and forced to work there, reportedly contracted by Dalpiterstroy. Not enough? Parts of the hospitality areas had to literally be demolished because they were substandard. And if any kind of spectator requires premium amenities, it’s those paying most. Before the Confederations Cup Zenit hope to have majority ready, all of the business lounges and private boxes will be done later this year. Not enough? Part of the field died as it was left unattended for months. Yes, the same field that was deemed too flexible by FIFA. For weeks Zenit’s greenkeepers have been working on salvaging the field. Yesterday it was in poor condition, but is expected to be of top quality in May. To make it even worse, the roof remained closed too long, not allowing enough sunlight and limiting ventilation. And the field cannot be moved outside the stadium, because that’s where the media village is being set up for journalists covering both FIFA tournaments in 2017 and 2018.